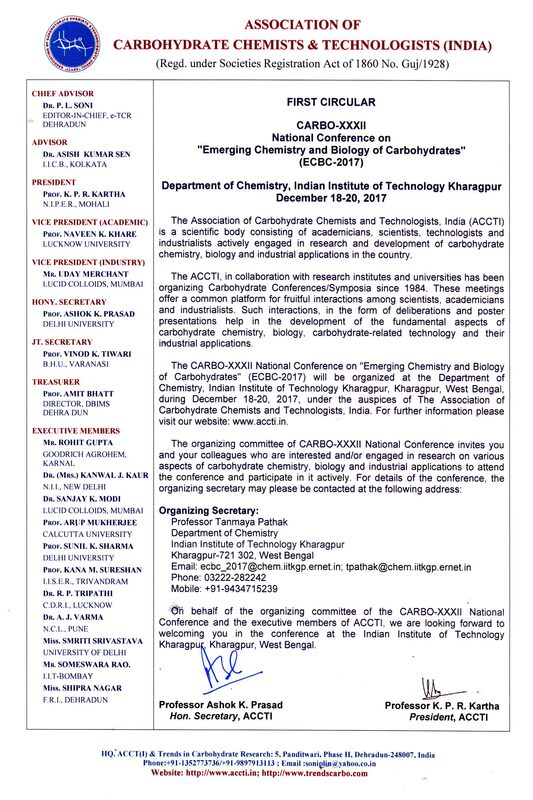 Welcome to the official website of the Association of Carbohydrate Chemists and Technologists, India (ACCTI). Since the Association was formed in the year 1984 by founder President Dr. H. C. Srivastava, it has been actively fostering research on carbohydrates, and carbohydrate industry in India. 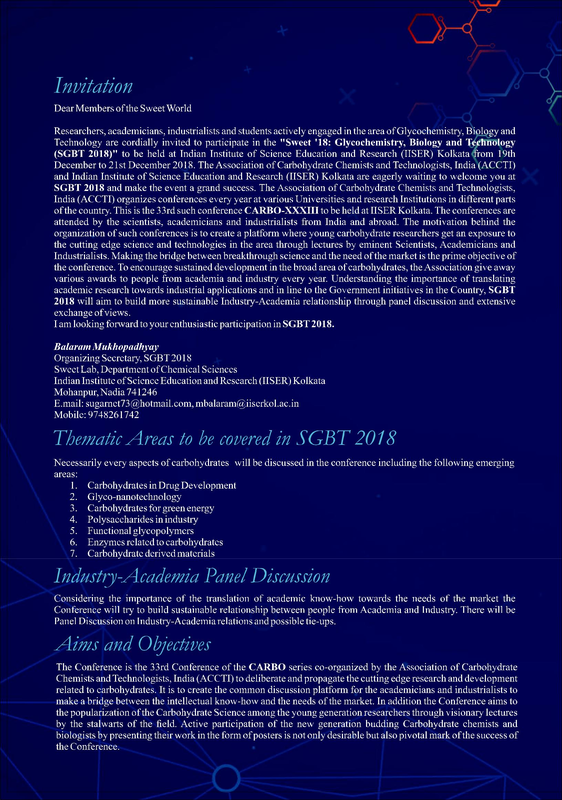 The foremost mandate of the Association is to promote carbohydrate research in India and also to provide a common platform to the chemists, biologists and technologists for interactive research. The Association organizes national conferences every year and international conferences every third year at various Universities and research Institutions in different parts of the country. 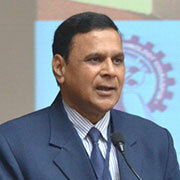 The conferences are attended by the scientists, academicians and industrialists from all over the world. Interaction through lectures and discussion, exchange of ideas on new developments and industrial requirements related to carbohydrates are the most important part of the conferences. The Association publishes a peer reviewed international e-journal, ‘Trends in Carbohydrate Research’ (TCR), since 2009. It also publishes a yearly news letter ‘Carbohydrate News Letter’ (CNL). Besides these, the Association and various Industries sponsor several awards to recognize contribution by individuals and also to boost carbohydrate research in India. 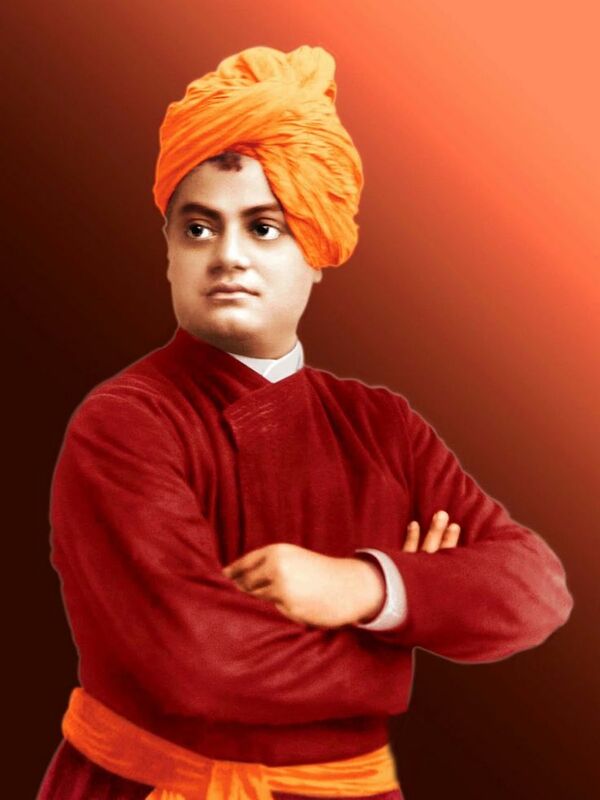 The Association is committed to its mission with the support of researchers, industrialists and well wishers from all over the world. We sincerely hope you will find this website interesting and informative. ACCTI Life Time Achievement Award-2018: Goes to Dr. G. Muralikrishna, Former head, Dept. of Biochemistry, CSIR-CFTRI, Mysuru. ACCTI Fellow Award-2018: The award goes to Dr. Amit Bhatt, Director (DBIMS), Dev Bhoomi Group of Institutions, Dehra Dun . 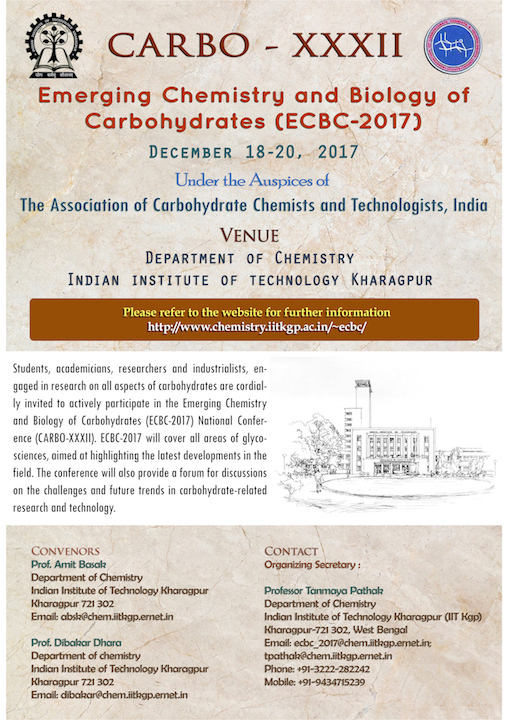 ACCTI Excellence in Carbohydrate Research Award-2018: Prof. Balaram Mukhopadhyay, IISER-Kolkata, West Bengal. Innovation and Excellence in Carbohydrate Enterprise Award-2018: Yet to be announced. Dr. H. C. Srivatava Young Scientist Award-2018: Winner is Prof. P. Ramu Sridhar, School of Chemistry, Central University of Hyderabad. e-TCR Award-2018: Winner is Prof. Hiromune Ando, Dept. 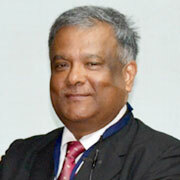 of Medicinal and Organich Chemistry, Gifu University, Japan. Prof. M. P. Khare Memorial Award-2018: Winner is Prof. Desh Deepak, Department of Chemistry, University of Lucknow. ACCT(I) Best Thesis Award-2017: The winner is Dr. Manish Kumar, Department of Chemistry, Motilal Nehru College, University of Delhi. C. G. Merchant Award-2018: The winner is Dr. Vineet Kumar, Forest research Institute, Dehradun. ACCTI Young Scientists Awards: To be announced during the conference. Lucid Colloid Young Scientist Award-2017: To be announced during the conference.